Passionate as the dawn? The dawn could have passion if it were a spirit, one that animates the poem’s end in a kind of synaesthetic epiphany, with “cold” suggesting the gold of the dawn and of the gong-like sound of the last rhyme, “one” and “dawn.” After the fisherman disappears with his flies, the spirit comes forth, “cold/ and passionate” as the man is “wise and simple,” as if the man dropped into a dream to resurface as the spirit of a nation. The weirdest part of this is that Yeats really believed it. “I believe,” he wrote, “in the practice and philosophy of what we have agreed to call magic, in what I must call the evocation of spirits.” Mind and memory were not irredeemably personal: universal, rarely conscious “great mind and great memory can be evoked by symbols,” and, for Ireland, should be evoked by artistic symbols, since “neither religion nor politics can of itself create minds with enough receptivity to become wise, or just and generous enough to make a nation.” Modesty this is not; but Yeats’s immodesty of ambition didn’t obviously lead to pride in accomplishments. He does not say he wrote the poem that he promised the fisherman. Perhaps only the fisherman could know, with the only ear wise and receptive enough to hear whether Yeat’s “Fisherman” is the poem Yeats promised him. Our common ears can only suppose. Being Numerous takes up the long and quixotic history of poets with ambitions as outsized as Yeats’s—“the powerful disjunction between the kinds of claims that some poets make for poetry—that it might remake consciousness, purify the soul, foment revolution, found an alternative social order—and any reasonable practical account of what can and does happen in an encounter between a reader and a poem.” This is a real problem for people who try to make sense of poems. I have never known a poem to purify my soul, yet I cannot learn about poetry by dismissing poets’ aims for their work. 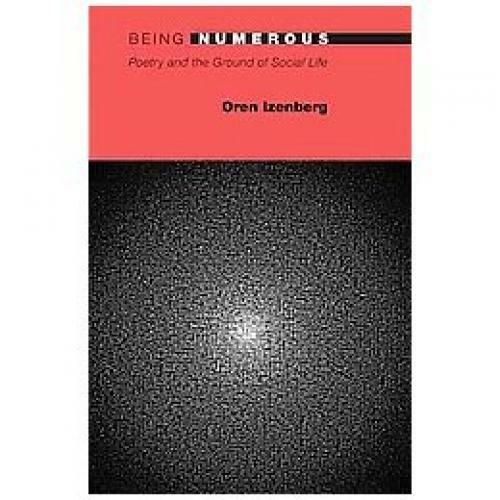 Izenberg offers an explanatory middle way between patronizing dismissal and credulous endorsement: he picks out a number of poets whose outsize ambitions are for a capacious category he calls “Poetry,” not for poems. “Poetry” would refer to any manifestation of the imagination—an odd usage, for which Izenberg cites Shelley’s “A Defense of Poetry,” the zenith of literary immodesty, from which we learn that “poets are the unacknowledged legislators of the world” and that Poetry encompasses philosophy, true science, history, and sovereignty, among other things such as poems. The poets whom Izenberg describes try to show through their poems what it means to be a person, as Poetry reveals. I would have liked to learn more from Izenberg about the specifics of Oppen’s conflicts than Izenberg describes. What did Oppen want from “the most intimate forms of relationship,” and why for him did World War II rob them of “comfort and hope”? What did Oppen want out of love, or happiness, and how could he get it from metaphysics of mind? The Yeats chapter has the same vagueness: what for Yeats could constitute national identity, and how could Poetry constitute it through poems? By training our ears? Izenberg sometimes loses sight of poems for Poetry, which includes the poets’ whole imaginations, much of which have nothing clearly useful to tell us about their poems. He frames poets’ concerns abstractly enough to explain their responses in the abstract, as Poetry, which can obscure the importance of poems as well as their textures. This is especially unfortunate because Izenberg’s greatest critical strength is his curiosity—the care and the sensitivity with which he approaches the poems he reads. His abstract readings work best when applied to the Language Poets, whose work is full of abstract ideas, the specifics of whose presentation do not merit close attention. Language poetry arose in response to two events, in Izenberg’s account: “the American government’s involvement in the Vietnam War and the American university’s enthusiastic reception of continental literary theory.” Language Poets opposed the former by means of the latter, opposed American militarism and commercialism by stripping the language of its culture-vitiating effects. Since those were the most conventional uses of language, Language Poets produced a mass of poems largely without coherence or closure or beauty. Language poems, on Izenberg’s reading, are “experiments or examples” of Language Poetry, meant to show the pure potential of language and to establish a kind of unconstrained communal freedom. One might be suspicious of such a conceptual link between incomplete sentences and utopia, as Izenberg is, but he also supplies their Poetry with a principle that best explains their beliefs even if it does not quite justify them. The principle is Chomsky’s universal grammar, “the unique capacity to produce language altogether,” which evinces “the existence of something fundamentally human on which the very possibility of social life can be predicated,” even if it is not clear how exercising it in new ways could effect “the reconstitution of ‘society’” for which the Poets hoped. Uh-huh. Izenberg’s book is serious and careful and smart, but it puzzles me how someone so sensitive to nuance in language could seem so often indifferent to his readers’ experience of his own prose. Izenberg’s book regularly obscures its own worthwhile criticism and intellectual history. What reason can poems give us to believe the ideas that they endorse? How and why can aesthetic reflection give us reason to believe the ideas that we reflect on? How can we tell revelation from rhetoric, “Great Art” from “the catch cries of the clown”? Academic English tends to outsource its answers to philosophers who tend to write the way Izenberg writes about Adorno. Izenberg urges critics to draw also on the methods and theories of a clearer kind of philosophy, the kind practiced in most English-speaking departments, whose members tend to find inspiration in mathematics and the sciences. They can build rigorous and legible theories, but they are not trained or often inclined to notice literary nuance. Critics tend toward the opposite. Perhaps the disciplines could complement each other to build better theories of literature, an ambition for which Izenberg’s example is an argument not just in his failures but in his achievements, which are numerous. Adam Plunkett’s essays and reviews have appeared in n+1, Bookforum, The Los Angeles Review of Books, and elsewhere.